Have you ever tried to sauté chickpeas? If not, don’t. I have and it is pretty scary. The chickpeas are full of moisture so they will pop out of the pan and hit you. Roasting them is another story. I tested a recipe for Indian-Spiced Nachos at Bon Appétit last year. They were so decadent and full of so many great flavors but not healthy at all. On of the toppings was a mix of roasted curried potatoes and chickpeas. I couldn’t stop snacking on them. They almost didn’t make it on to the finished dish I had to present to the editors. 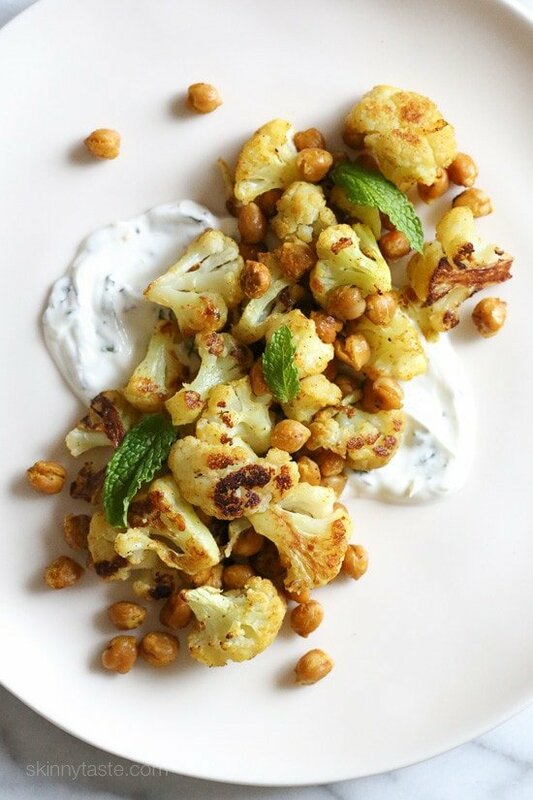 In an effort to still enjoy the flavors yet lighten things up a bit, I decided to create this roasted cauliflower and chickpea dish with minty yogurt. It’s great for lunch or as a side dish with dinner. I added a touch of sugar to the yogurt because I think the sweetness balances out the flavors. The lemon zest and mint really brighten things up and I like the contrast between the cold yogurt and the warm cauliflower and chickpeas. I hope you like it too! 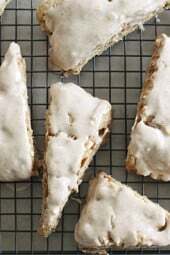 Guest author Jackie Ourman, who writes at CAFE Celiac & Allergy Friendly Epicurian and I tested these out myself while taking the photos and we LOVED this recipe although I added some fresh garlic! Visit her site for more gluten-free recipes. 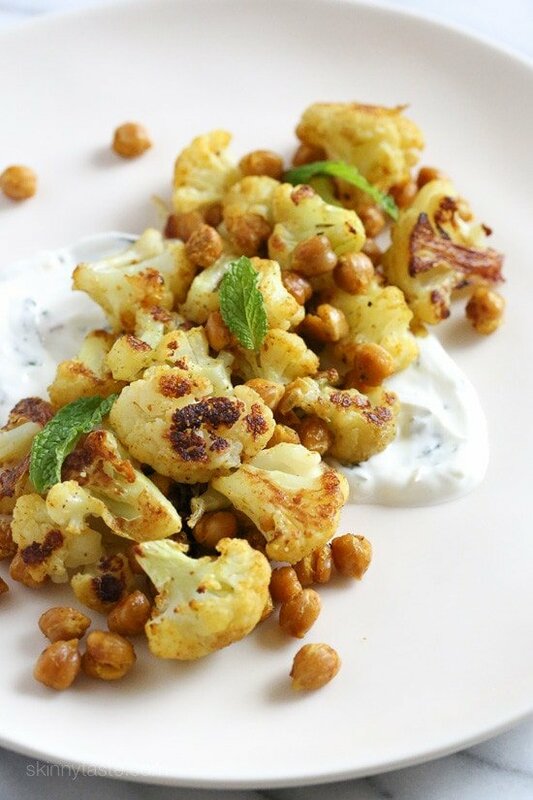 In an effort to still enjoy the flavors yet lighten things up a bit, I decided to create this roasted cauliflower and chickpea dish with minty yogurt. It’s great for lunch or as a side dish with dinner. 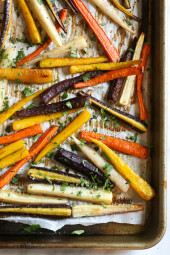 Heat oven to 425 degrees Fahrenheit, line a baking sheet with foil and spray with cooking spray. In a large bowl, toss cauliflower florets, drained chickpeas, olive oil, curry powder, salt and pepper together and spread on baking sheet. Roast in oven, 30 minutes, tossing halfway through, until golden brown. Meanwhile, mix yogurt, mint, sugar and lemon zest together. Add kosher salt and pepper, to taste. To serve, divide yogurt and spread on the bottom of each plate, top with roasted cauliflower and chickpeas. Gina, I’m new to WW but not your website (love love love all of your recipes!) and had a question. With the new smart points WW diet everything in here (except for the EVOO) is zero points I believe (including FF yogurt). Am i thinking about this wrong or would this only be a point or two smart points? Delicious! I had some purple cauliflower on hand, and it was delightful. Thank you! When I plugged this one in for points, I got a different number (I did it both by nutritional info and by ingredient). I cut down on the oil from 1 1/2 TBSP to 1 1/2 tsp, and that brought it down to 5 points. Maybe I’m missing something? I made this last week for dinner… so yummie! I ended up sautéing spinach and quinoa in coconut oil and then adding the roasted cauliflower and chick peas to it. It made it in to a meal! So good. Made this for lunch and its delicious. The only thing I did differently was to roast it for 45 minutes instead of 30. This will be a regular in my rotation. A nice change from soup. And handy for Lent. Love this reminds me of a great restaurant in Philadelphia I just took my husband for his birthday. What main dish protein would you serve, I don’t eat lamb, so something chicken. Anne – I realize this is a SUPER delayed response but in case you see this – I served with Gina’s Tortilla Encrusted Chicken Tenders. Delish! This was spot on! The yogurt addition to the dish was a delightful surprise to this girl. Note–I didn't have any mint handy, so with sans–still delish. I've made this 3 times since you posted it — I love it! I eat a double portion as my main dish. I could probably eat the whole recipe in one sitting! Great idea!! Reminds me of chana masala dish. I'll try this version! I'd like to try this as a side, but am unsure of what would go well with this. Any suggestions? I'd like a suggestion on which protein to use and what kind of flavors for that protein that would compliment the cauliflower and chickpeas. Thank you in advance! Gina, your food makes my heart SiNg!!!! Sounds delicious.. but too many Carbs for me (the chick peas)..I will however do a curry culiflower roast with the pine nuts/slivered almonds and a sprinkle of raisin or cranberry/craisin… so enjoy your recipes! Great idea, this looks delicious. Roasting garbanzo beans has been on my to-do list for some time, you have pushed me over the edge as I love roast cauliflower. This looks awesome! 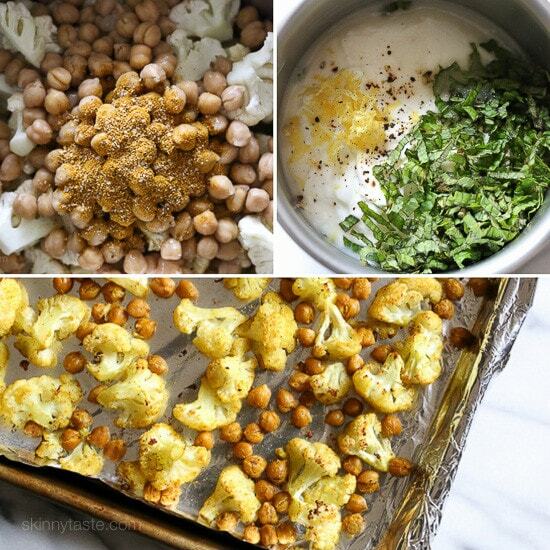 I love roasting cauliflower, so adding chickpeas would be delicious! This looks absolutely amazing! I can hardly wait to try it. What a beautiful dish, Gina! I adore roasted cauliflower. Can't wait to give this a try! There used to be a nearby restaurant that made a roasted cauliflower with herbed yogurt, but the extra ingredients were pine nuts and golden raisins. That would be great here too! This looks delicious, and I am looking for more veggie, fast, limited ingredients recipes. Thanks! I'm not a huge mint fan. Other suggestions to sub? Tarragon might be good with this. Or just plain flat-leaf parsley. Cilantro?